These Blue Ridge Mountains speak to people, and the DeAngelos listened. It’s been approximately ten years since Phil and Tina DeAngelo made their move to Asheville from Ocean City, New Jersey, leaving behind a business, a surfing passion, and a home with acreage for this new life. 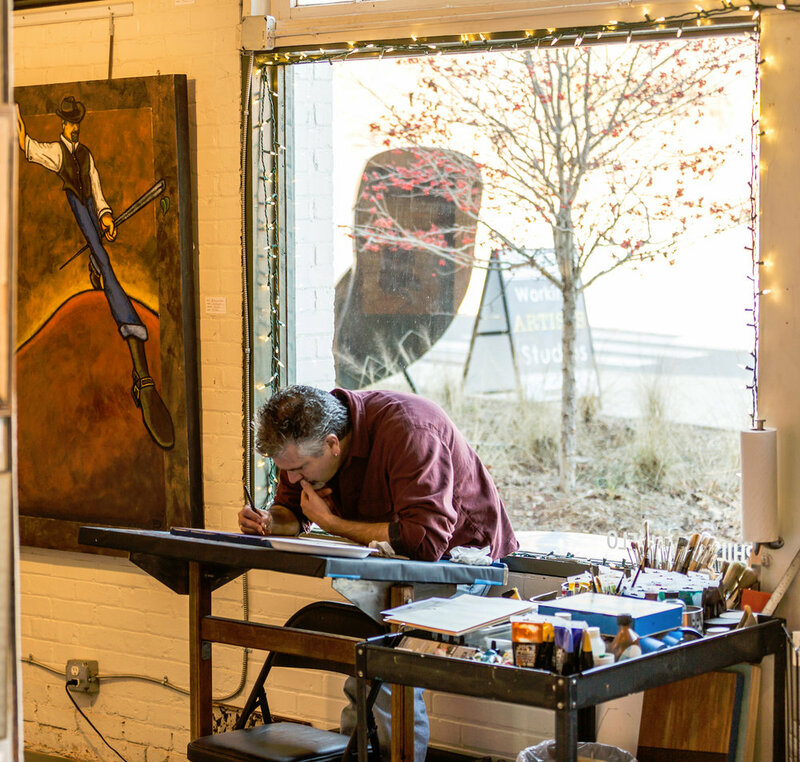 Like many before and after them, they were drawn to Asheville for the thriving arts scene, the outdoor splendor and the sense of community they felt when they first visited. Once settled, it didn’t take Phil long to find a community to embrace in Asheville. He has established himself as one of the ‘go-to’ artists for home interiors; a supporter of local charities including Asheville Humane Society and Open Doors of Asheville, and an enthusiastic encourager and mentor to his network of artist peers. When we visit Phil’s Asheville art studio you’ll get a warm greeting from the DeAngelos,’ and likely from one of their four border collies (regularly joining Phil and Tina at work). As you look around the room, one of the first things you’ll notice is his bold use of color, and variety of surfaces Phil uses in his paintings. Repurposed ceiling tiles, salvaged wood, Masonite board, or plain surfaces that have added texture can give him a start to tell his stories in vibrant bold imagery. “Minimalist landscapes” is a perfect description of his paintings. 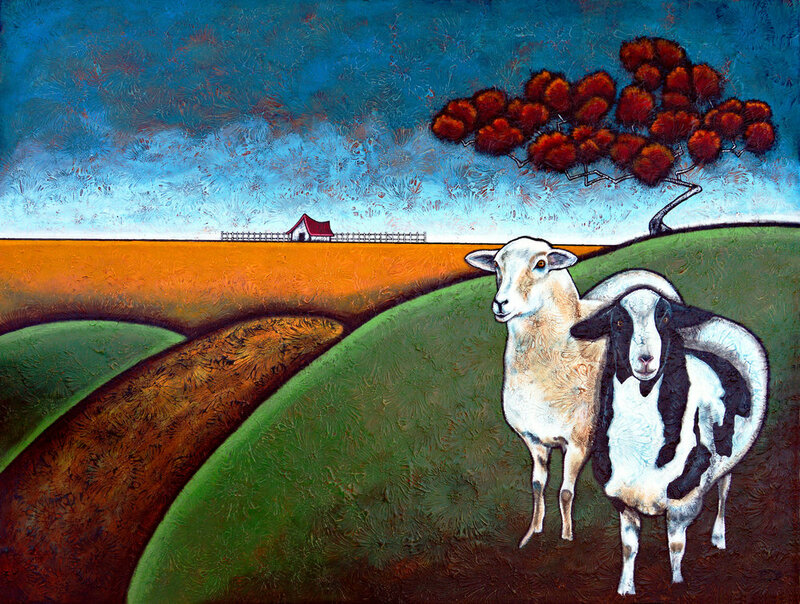 Mountains and trees are a common theme, as well as sheep and small farmhouses. Occasionally a horse or a cow will make its way into a painting! Another observation is the frequent use of a division line that separates sky from ground, or distant mountains from foreground through his use of “the golden section.” Found all around us in nature, in architecture, and in art, the golden section is a specific and mathematically calculated separation of an area, which creates a pleasing balance and overall sense of harmony. In Phil DeAngelo’s studio you’ll find a peaceful, welcoming and colorful encounter…let’s plan a visit!